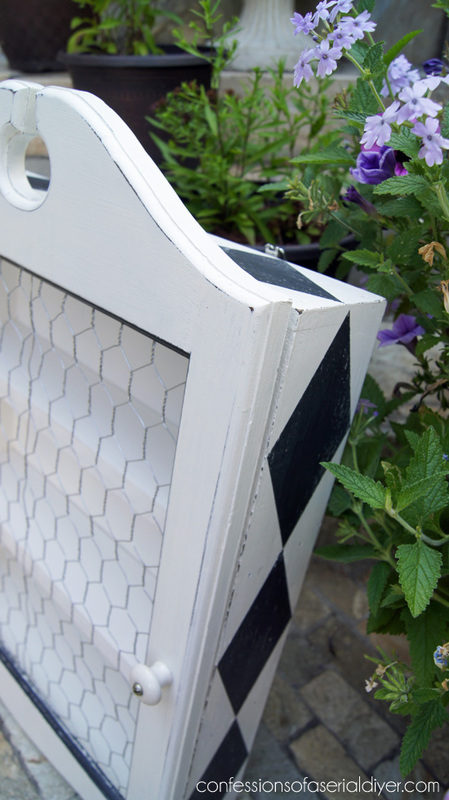 Chicken wire isn’t just for chickens, but of course you are so smart…you already knew that! 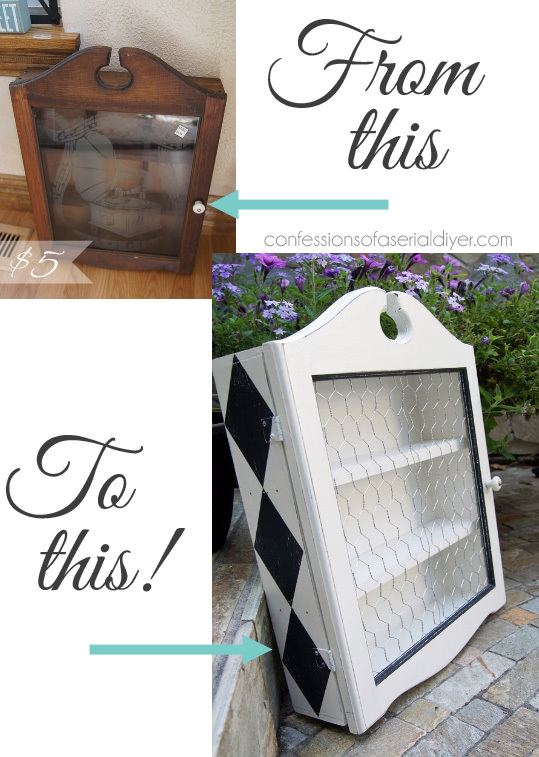 Today I’m sharing a quick little redo on a cabinet I found at the thrift store for five dollars. I snatched this right up and was so excited to show my mom (who was with me at the time), but she raised her nostril so high (not a good sign, I can assure you), that I almost put it back. Almost. But I had faith. I’m not sure what this little cabinet was intended to display. The shelves were only about two inches deep! I kept the same knob. It works with this cabinet. I used frog tape to tape off my diamond pattern and painted right over the hardware. I love the harlequin pattern. It adds a touch of whimsy. As does the chicken wire. 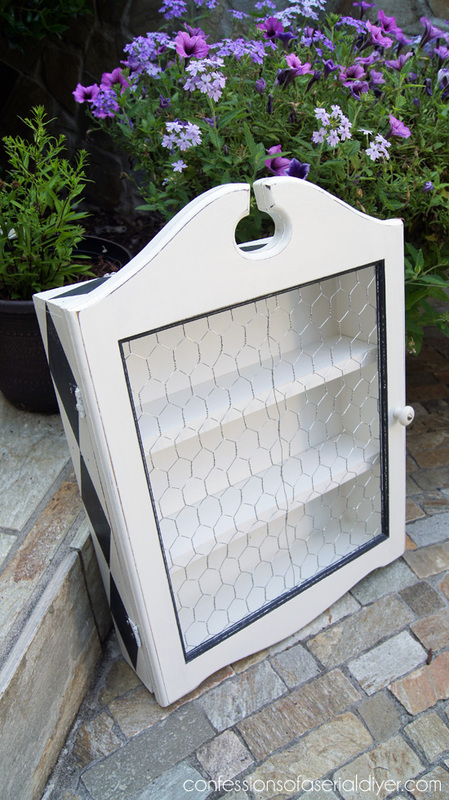 This could be perfect in a kitchen to hold spices; in a bathroom to hold nail polish, perfumes, or other toiletries; or even in an office to hold extra supplies. 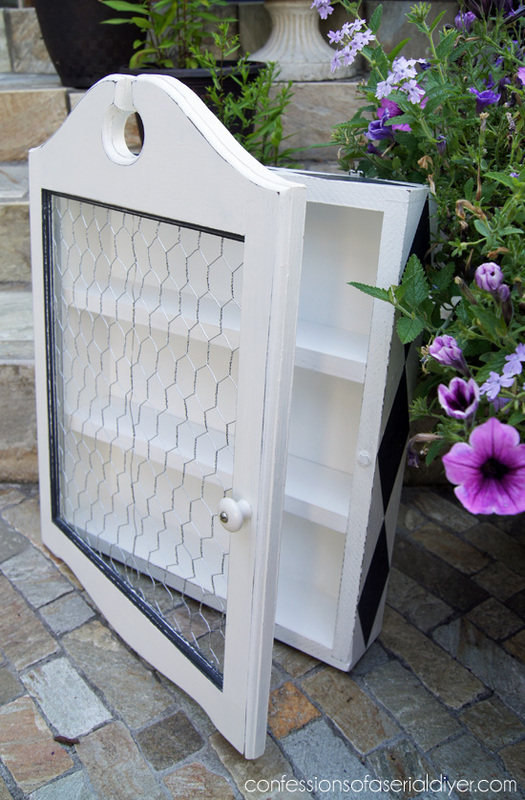 You can also use the wire front as a message board using clothespins to hold things in place! I’m also excited to share that I am back in the show circuit. After an eight year hiatus, I decided on a whim to apply for the big Christmas Market in our area and was accepted! Now I need to get some inventory going. This cabinet will be a fun addition! What do you think? Christy, this is fantastic!! What a beautiful job you did and I love the harlequin pattern. I think this will be a wonderful addition!! 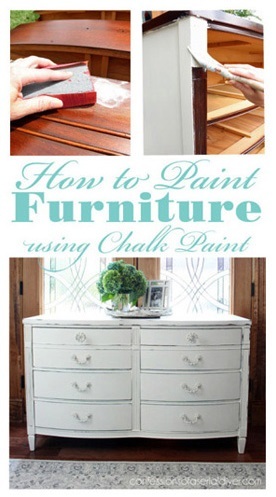 Thanks for sharing – I’m pinning and tweeting about this beauty. 🙂 Have a wonderful Sunday! 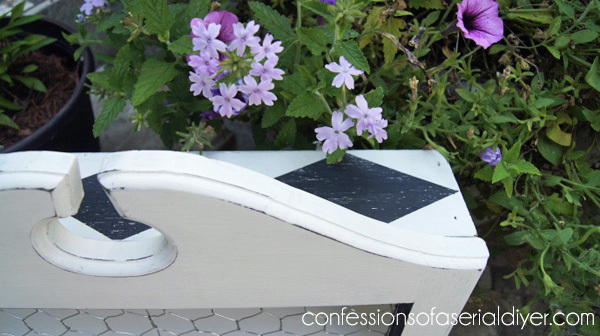 Sweet upcycle! I have a roll in the barn just waiting to be used. 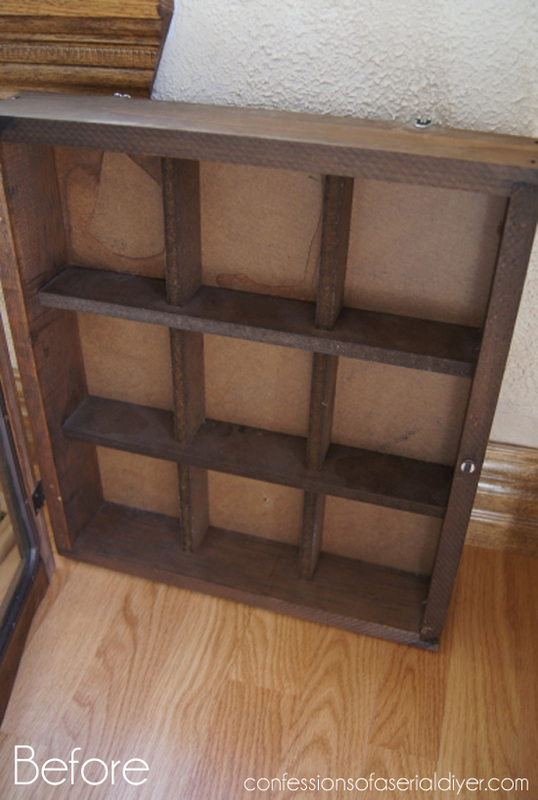 Plus I have an old tall gun cabinet that I’ve been wondering what to do with… ideas! Wish you lived closer! I’d snap this up in a heartbeat! Okay, I love the cabinet, and you crack me up…Yes, I was sitting here reading the post trying to do the nostril thing…. 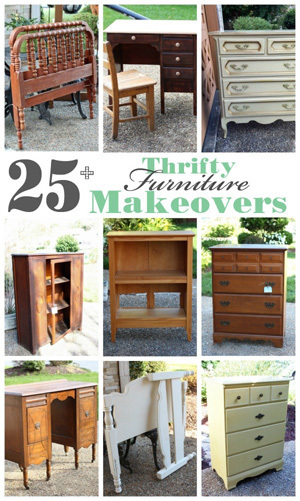 What a fabulous makeover, Christy! You had a vision with this and it turned out beautifully! 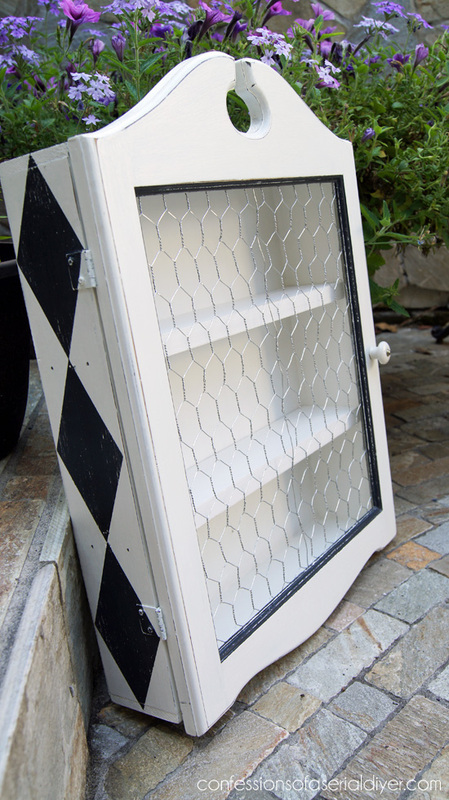 Love the cabinet…especially when seeing the “before” pic and I really like how you added the chicken wire! You did a great job! Thanks for sharing…. 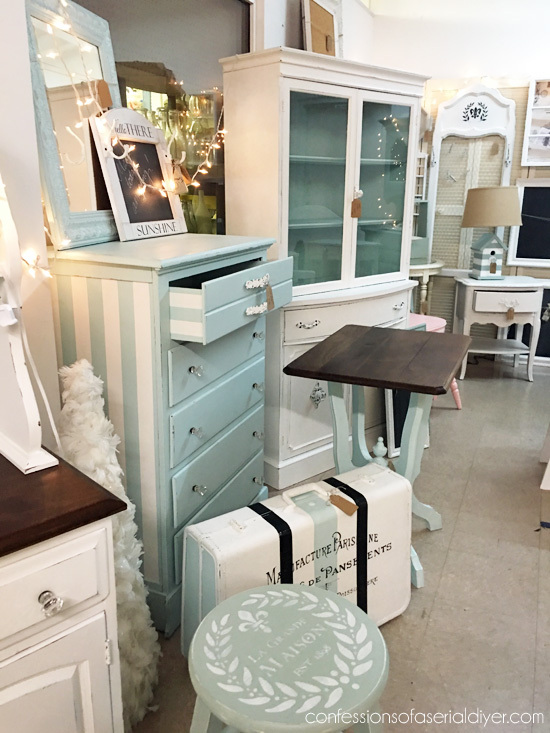 Very cute little cabinet! I’ve got one sitting in the garage that’s in need of a chicken wire treatment, too. Love the makeover! Hope you are doing well! And thanks for sharing this on Project Inspired! Pinned! love your little cabinet. don’t know how you will part with it. I can see so many uses for it. I love it! You did such a fabulous job!! I don’t know how you will part with it!! I don’t think I would be able to! 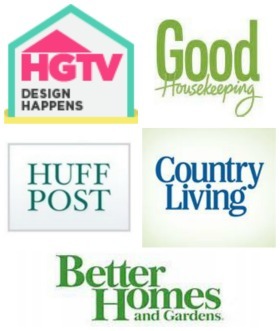 Thanks for linking up with us at our LOBS Link Party! Following you now!! What a beautiful transformation. 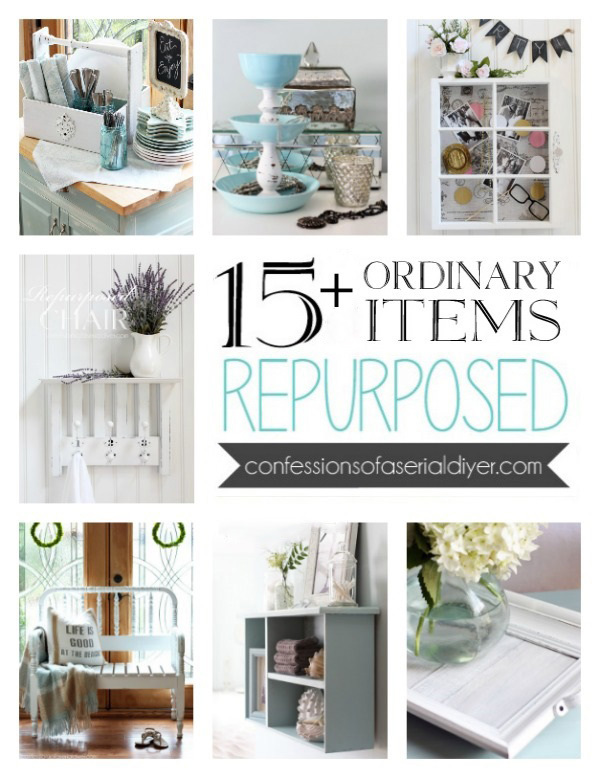 Thank you so much for linking up to my linky party. Hope to see more from you next time. Wow, looks great! I can’t believe your mother would raise her nostril at that! Couldn’t she see the future of it? 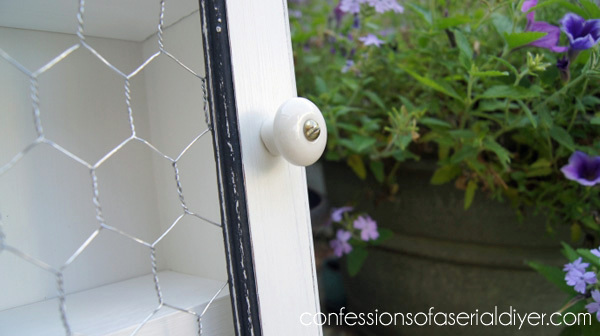 hahaha Love the chicken wire. I was going to do that with my kitchen cupboards but since I actually live on a farm where it’s so stinkin’ dusty I decided maybe not. LOL But now I’ve got something else to look for thanks to you. Thanks, Toodie! My mom is silly sometimes…she has only recently ventured into the thrift stores with me. She used to wait in the car if I wanted to stop!! So I guess she’s making progress ha ha! This was a fun project. Thanks for visiting! We have a giveaway going on right now so its perfect timing! You can enter to win some vintage pretties! Have a good evening! See you soon! I have a question for you. 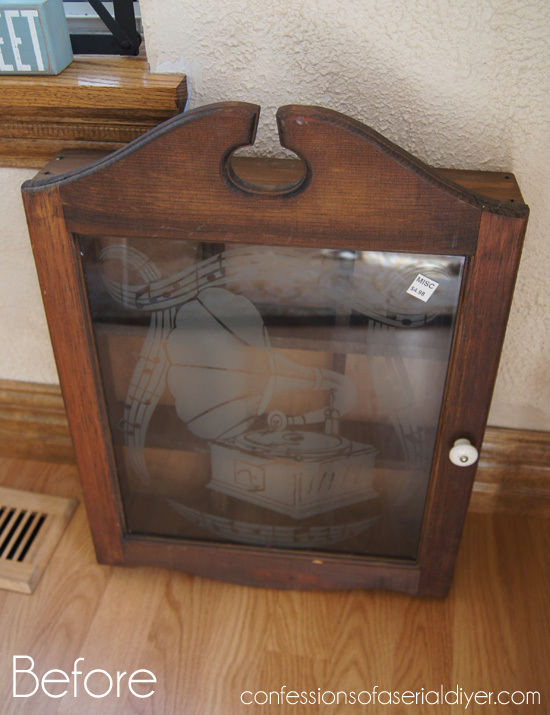 I have an antique wood cabinet with a glass front–it may have been a medicine cabinet. What’s weird is there are NO shelves. I need shelves 🙂 How did you add shelves to this cabinet? I’m also afraid of damaging the cabinet in the process. Curious what size chicken wire this is … Looking to make a few crafts with cw for teacher gifts and wasn’t sure what size of hexes to use?